Some researchers believe that the ruins of an ancient observatory and mysterious rock inscriptions have been discovered in Russia's Northwest, and consider them to be vestiges of the ancient Hyperborea civilization, a sacred land similar to Shambhala or Atlantis. Scientists, however, say that the ruins evolved in a natural way, without man's intervention. Lake Seydozero is one of the most mystical places in Russia's Northwest. 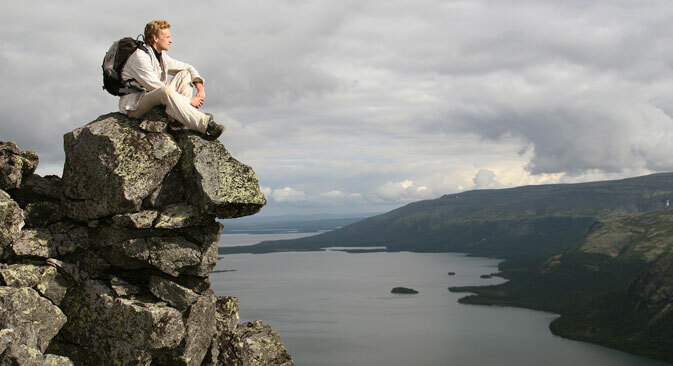 Surrounded by mountains, it is hidden in the very heart of the Kola Peninsula. Its name means "the sacred lake" in the language of the indigenous Sami people. They consider the lake to be a special place, where it is permitted to go only upon necessity, in order to appeal to the Great Spirit for advice or protection. But not everyone will have the courage to go to Lake Seydozero just out of curiosity. To get there one must first traverse a gloomy gorge and a dangerous rocky mountain pass. Even modern tourists have a respectful attitude towards the lake, especially after hearing hundreds of stories about its strange mystical phenomena and special peaceful atmosphere. Lake Seydozero is protected by Kuiva the Giant, a gigantic figure impressed on a rock. Its origins are still unknown. Sami legends say that the Gods punished the mean giant by striking him with lightning and turning him into a rock. Researchers inclined to mysticism believe it is here that Hyperborea, the mythological civilization similar to Shambhala and Atlantis and mentioned in Ancient Greek texts, left its trace. According to Ancient Greek legends, the land of the Hyperboreans, the people who had secret knowledge and were close to the gods, was often visited by Apollo himself, the personification of the Sun. Advocates of this theory are looking for proof in the similarity of the languages. Valentina Sharipova, director of Hyperborea, a Murmansk research organization, is one such researcher. She says that the roots of the name ``Kola’’ hark to the name of the Slavic sun god, Kolyada. And ``Hyperborea,’’ if translated from Ancient Greek, means "beyond the north wind." Tourists and researchers of mysterious phenomena often find unusually shaped stones around Lake Seydozero that look like ruins of ancient structures. "Recently they found remains of an observatory: stones with hollows, which were directed at the polar star," says Sharipova. "Many rocks have inscriptions or runes carved into them." There are other facts about the Kola Peninsula that are puzzling researchers. In the beginning of the 20th century scientist Alexander Barchenko found a mysterious underground entrance in the vicinity of Lake Seydozero. His findings were classified as confidential; no one saw the entrance to the cave and the researcher himself was shot. Today Barchenko's research is being continued in Russia by the Cosmopoisk organization. The members of the expedition have also found several caves, but for now only ordinary ones. "We will have an answer to this mystery only after we find all the caves," says Vadim Chenobrov, the director of the organization and a researcher of unexplained phenomena. "I am prepared for anything that we find. With regard to ancient cities, I believe that if we do find some structures, they will be underground or underwater. I hope some of these legends will be true." Messages from the Gods or the work of geologists? Scientists are amused by these enthusiasts who search for the sacred land in the Russian North. Beautiful legends attract tourists to the region, and brings revenue. "There was an interesting situation recently," says Director of the Geological Institute of the Kola Scientific Center, Professor Yuri Voitekhovsky. "Workers of the local mining and processing plant were testing a new drill from Finland. They bore a series of openings in the stones. Then the seekers of Hyperborea decided that the openings were some kind of ancient "hollow" letters, whose meaning is expressed by the depth of the hole. They were raving about it for several years until someone explained the real cause of the holes to the weirdoes. But in the end they did not learn anything." According to Voitekhovsky, the regular-shaped stones and the drawings on the rocks are explained by the natural qualities of the rocks. In science the phenomenon is called "cleavage": the rock splits into certain directions depending on how it was formed. This creates the plates and the cubes, which are considered "ancient observatories." Furthermore, as a result of various influences, cracks are formed on the rocks; cracks that sometimes have an exotic form. "Once I carried out a little experiment," Voitekhovsky continues. "I went to the mountains and photographed a very complex web of cracks on a rock. In this pattern I found all the runes of the Scandinavian alphabet!" These conclusions, however, do not convince the dreamers who believe in the land of eternal happiness. For them Hyperborea exists, if not as a real place, then at least as the land of the Shambhala spirit, which cannot be found in the material world.